Unfortunately, to be a pedestrian in Castro Valley can be a life-threatening experience. From Central CV to the hill areas around central, there are blocked, unimproved sidewalks on the majority of the streets. This forces pedestrians to constantly walk around the property, and around the parked cars and into almost the middle of the street. For example, to get from my house behind Redwood Road, and walk to the Post Office on Santa Maria, I encounter seven blocked sidewalks in the three blocks on Jamison to Santa Maria. The ‘poster child’ here is where one property has put up a picket fence on their unimproved sidewalk – leaving 9 inches – and then frequently parking a car against the curb. 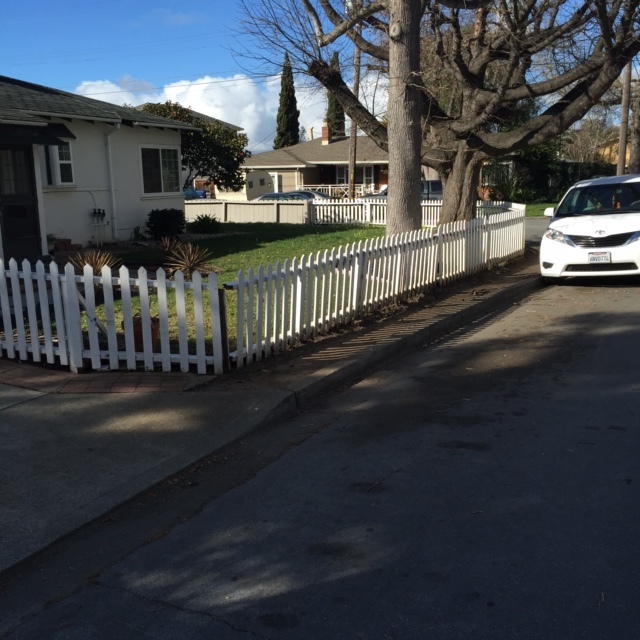 A picket fence blocks the unimproved sidewalk and public-right-of-way. It seems if you have an unimproved sidewalk in front of your house and you want to extend your personal front yard, simply let it grow over the public right of way, or plant some plants there, or put in a flower bed on the unimproved sidewalk, or a retaining wall. You have successfully enlarged your front yard (illegally), and the public has to walk in the street. Overgrowth blocking an unimproved sidewalk and public right-of-way. 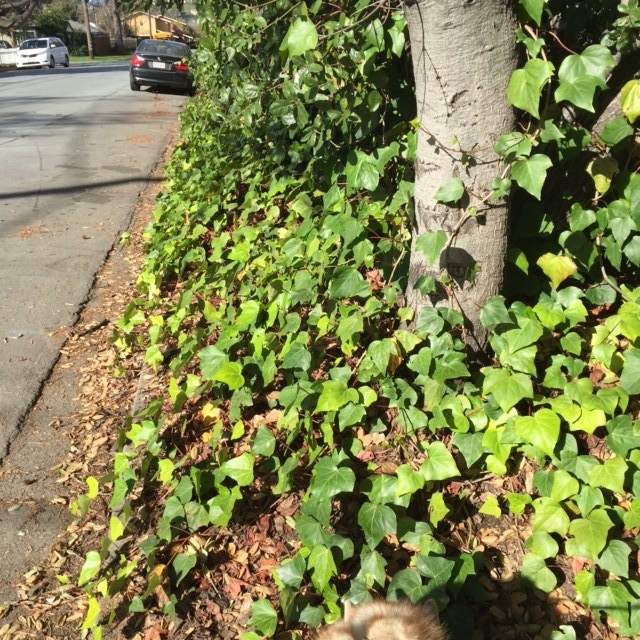 There are miles of these non-concrete sidewalks / public right-of-ways in Castro Valley. A lot of them are on level ground and could be used by people walking (not necessarily with strollers or wheelchairs), if they were not blocked by overgrowth and cars. Getting the cars off the sidewalks only solves half the problem — we must remove the rest of the overgrowth from these public right-of-ways. Working as part of BikeWalkCV, we have been investigating ways to get Public Works and Code Enforcement to correct this huge problem for Castro Valley. They do a good job of code enforcement on weed abatement: notifying the owner to remove the weeds, and levying a fine if they don’t. Why can’t this be the protocol for the disappearing, unimproved sidewalks? Public Works has agreed that they will address each incidence reported on the Mobile Citizen App (Mobile Citizen iOS app and Mobile Citizen Android App), and the more reports of the same incidence, the higher the priority for action. This is the action we want folks to take. It could be realistic to have people remove their illegal greeneries, rocks and other obstacles from the public right of way within a year or so, and to have them create 4 feet of walkable space (dirt, not concrete or paved). No individual can move the county to do that, but meeting with Nate Miley and the formation of the BPAC (Bicycle and Pedestrian Advisory Committee) gives us cause for hope. Please get going on the Mobile Citizen App now! Pam Bovyer co-authored this post.